The small town of Ubud is one of the most popular places to visit in Bali, Indonesia. Just 40 kilometres from Denpasar airport, it’s a perfect first stop for any Bali itinerary. There’s plenty of amazing things to do and places to see in the areas surrounding Ubud – from beautiful rice terraces to rushing waterfalls to sacred temples. Despite being a small town, it’s perfect for tourists with a variety of restaurants serving both traditional Balinese cuisine as well as Western dishes. Like much of Indonesia, Ubud is a very affordable destination – with some brilliant accommodation options available for very low prices. Find out everything you need to know about the area with this travel guide to Ubud, Bali. Unsure what to pack for your trip? Check out our guide of what to pack for Bali to make sure you have everything you need to make it the trip of a lifetime! As it’s one of the main tourist destinations in Bali, you’ll have no problem getting to Ubud. There is no bus from Denpasar airport to Ubud so if you’re going straight from the airport you’ll need to get a taxi. If you’re coming from elsewhere in Bali you’ll have the choice between a taxi and shuttle bus. Taxi – There are a number of different taxi services available to take you from Bali’s Denpasar airport to Ubud, with the fare varying between all of them. The travel time when going from Denpasar to Ubud varies depending on traffic but should take between 1-2 hours. The cheapest option is to order a Grab from Bali airport to Ubud. Grab is the equivalent of Uber and so you’ll need to use mobile data or connect to the airport Wifi to order a taxi. As the taxi mafia in Bali don’t like people using online taxis, they will try to convince you that you can’t use online taxis from the airport. There are actually designated pick up points for Grab at the domestic arrivals area of the airport. It’s a little bit of a walk but it could save you quite a bit of money as the fare from Denpasar airport to Ubud on Grab can be around 150,000 Rupiah if you’re lucky. Some drivers prefer to pick you up at the international departures drop off point, although in our experience they didn’t show up. The best option if your flight arrives into Bali airport at night is to pre-book transport through your accommodation. They should quote a fair price, and their driver will know the exact location of the accommodation. If you just find a driver at the airport they often struggle to find hotels and homestays in Ubud and so you may end up spending a long time trying to find your accommodation once you get to Ubud. Alternatively you can find a driver upon arrival at the airport. Plenty of drivers will offer their services to you and take you anywhere you want to go. Most drivers will try to overcharge you, so be sure to negotiate a good price. During the day you should be paying around 300,000 Rupiah and at night around 400,000 Rupiah. If you’re being quoted more than this find another driver – there are plenty there who will be happy to charge a fairer price. The final option is to take a bluebird taxi – which is a metred taxi. Taking one of these ensures that you won’t be overcharged, but make sure they turn the metre on and don’t try and charge you a different price. Technically bluebird taxis aren’t supposed to pick people up at Denpasar airport, so you’ll need to go up to departures and get into a taxi that has just dropped people off. Your other option is to download the bluebird taxi app and book a driver upon arrival at Bali airport. 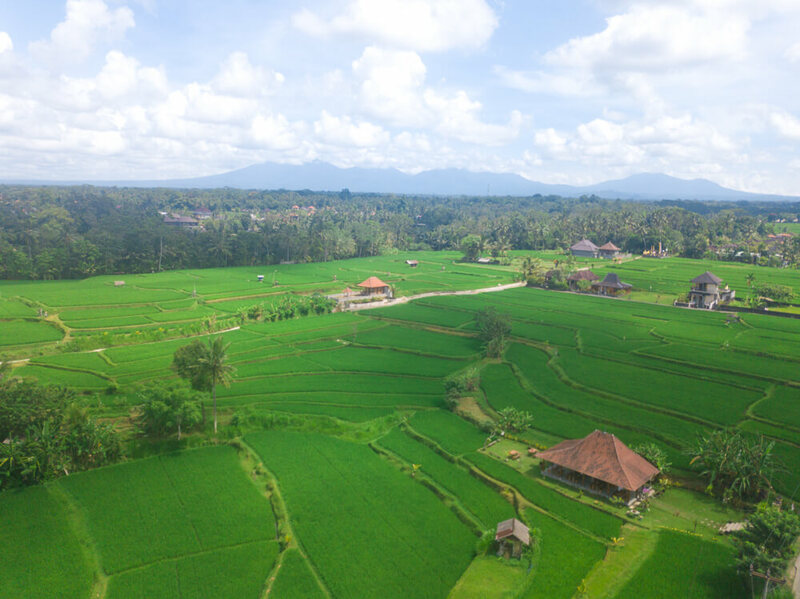 It’s possible to get from a number of other areas to Ubud, and if you want to arrange a taxi we recommend finding a local driver online and negotiating a price via Whatsapp. Shuttle – It’s possible to catch a shuttle bus to Ubud from most places in Bali. The prices will vary depending on where you’re coming from, but a shuttle bus from Lovina beach to Ubud costs just 125,000 Rupiah with Perama Tours. Click here to see their full schedule and to book transport to Ubud from around Bali. One of the easiest ways to get around Ubud is by renting a scooter, which costs around 60,000 Rupiah a day. It’s possible to rent from a number of stores around Ubud, and many guesthouses in Ubud will also have scooters available to rent. If you plan to rent for longer term you will find better rates available. Make sure to be extremely careful if you are going to ride a scooter, especially if you don’t have the correct license. You may get fined for doing so but the main danger is of course being involved in an accident. Not only can you get severely injured but also if you’re driving without the correct license then your travel insurance won’t cover you. That means you’ll have to cover your own medical expenses if you do get into an accident. If you haven’t already got travel insurance for your trip, click here to get a quote. If you’re staying in Ubud town, everything you need is in walking distance. There are plenty of Warungs and restaurants in Ubud, and attractions like Ubud Palace and the monkey forest can be reached on foot if you’re happy to walk in the heat. It’s also possible to hire a driver as a kind of personal tour guide for exploring the attractions near Ubud, such as the Tegalalang Rice Terraces and waterfalls. As you walk through Ubud, you will be approached by a number of drivers offering their services for day trips around the area. Work hard to negotiate a good price as they will try to charge as much as they can. A fair price for a full day trip is around 500,000 Rupiah. These trips are a great way to see the best of Ubud in a day! The best time to visit Ubud if you’re looking for dry weather is between April and September as it’s Bali’s dry season. Unfortunately, it can be particularly busy during July and August due to European school holidays, so you may want to avoid these months. Although the rest of the year from October to March is considered rainy season, the heaviest rainfall and worst weather in Bali is between December and February. Some days will still be nice during these months, but if you’re visiting in rainy season it may be worth trying to plan your trip outside of these months as it isn’t the best time to visit Bali. Tegalalang Rice Terraces – The Tegalalang Rice Terraces are a must see when in Ubud, Bali. 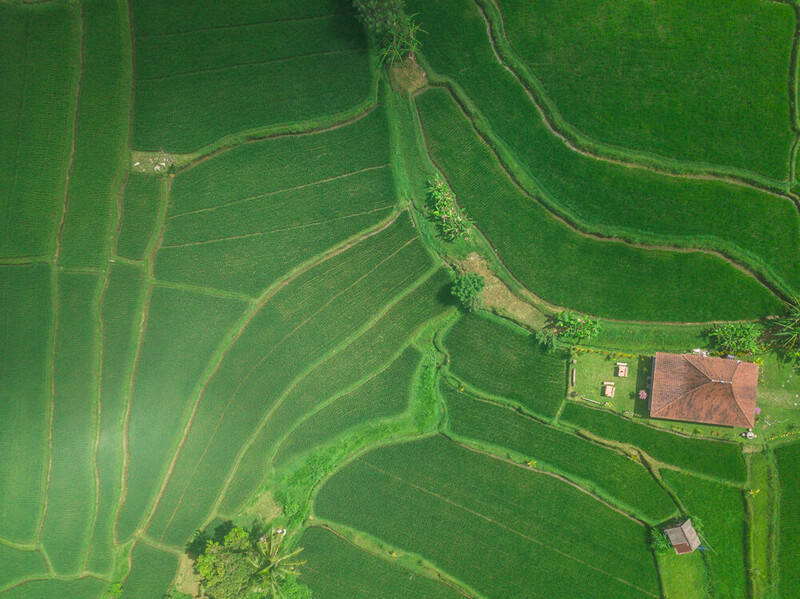 It’s one of the most picturesque places in Bali, thanks to the beautiful green rice paddies. You can easily spend hours getting lost amongst the many paths or just enjoying the view from one of the restaurants above the Tegalalang rice terraces. 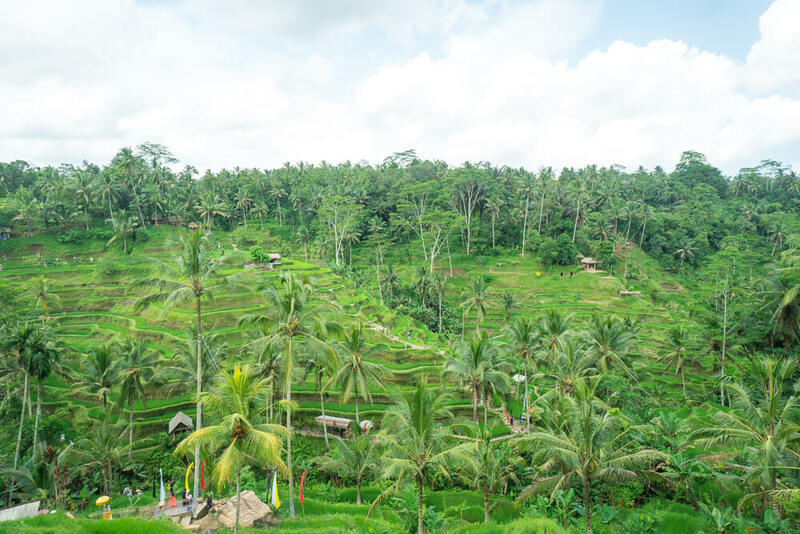 The entrance fee to the Tegalalang rice terraces is 10,000 Rupiah, although you’ll have to pay extra if you want to have a go on a swing or use certain paths around the terraces. In our opinion these terraces are one of the best things to see in Ubud. Click here for a detailed guide on visiting the Tegalalang rice terraces! Waterfalls – There are a number of waterfalls near Ubud, which are perfect to include on a day trip in Bali. The most popular of these is Tegenungan waterfall, which is around 10 kilometres from Ubud and is the perfect place for a swim to cool off from the heat. Unfortunately, being the most popular waterfall it’s also the busiest so you may want to find some more secluded spots! The beautiful Kanto Lampo waterfall is just 10 kilometres from Ubud and is much less busy, especially if you make it your first stop in the morning. Kanto Lampo is certainly one of the prettiest waterfalls in Bali, despite only being around 15 metres high! 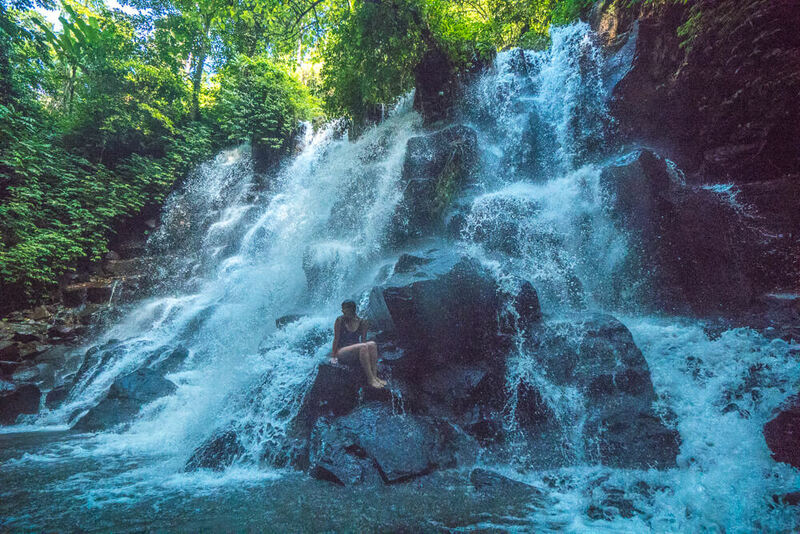 Tukad Cepung waterfall was previously one of the hidden waterfalls near Ubud, but thanks to some incredible Instagram photos is now regularly busy! If you visit at the right time light rays shine through to this cave waterfall, giving an almost magical feel to the setting. Arrive before 10am for the best chance to see the rays shining in. There are plenty of other waterfalls to choose from, but we’d recommend visiting Kanto Lampo and Tukad Cepung from Ubud. If you’re looking to tour more waterfalls in Bali, head north to check out Sekumpul waterfall, Banyumala twin waterfall and Gitgit waterfall. You should also make sure to visit the small village of Munduk, which is well known for its waterfall trek. 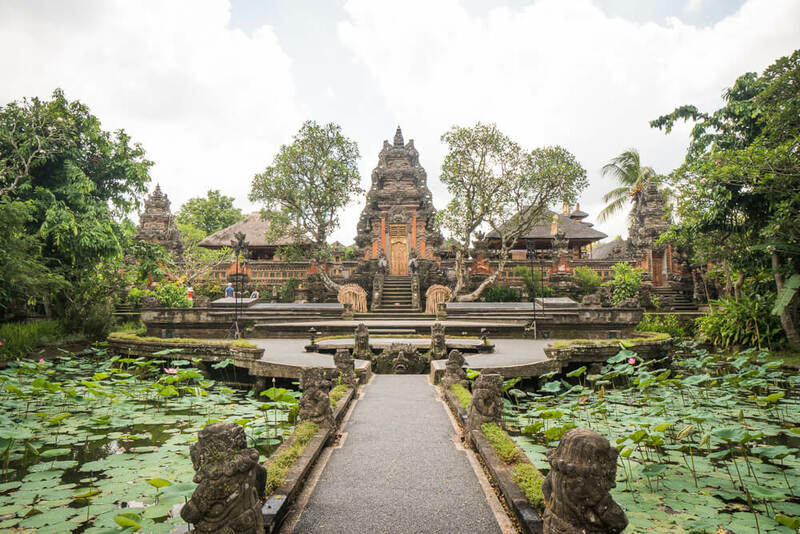 Temples – There are a number of impressive temples in Bali and visiting them is certainly one of the best things to do in Ubud. While there are plenty of temples in Ubud, our favourite in the town itself is Pura Taman Saraswati temple. Outside the temple itself there is a beautiful lotus pond, which makes it a lovely setting and a special spot to visit. If you’re planning a day trip around the area, you may want to visit Tirta Empul temple – a famous water temple close to Ubud. Balinese Hindus visit Tirta Empul temple and get in the water to cleanse themselves. Although it may be tempting to do so yourself, one tourist suffered a severe eye infection due to the water being contaminated with E.coli, so we’d recommend giving the cleansing a miss. Other temples around the Ubud area you may want to visit include Goa Gajah and Gunung Kawi temple. Both of these temples are located outside of Ubud itself, and are thought of as some of the best temples in the Ubud area. Goa Gajah translates as elephant cave which refers to a unique cave on site with intricate carvings around the entrance. Gunung Kawi temple consists of 10 shrines carved into a cliff face, and it is believed the shrines may be dedicated to Indonesian royalty from around 1,000 years ago. As with all temples in Bali you need to be dressed respectfully in order to visit. You may be issued a sarong to use during your visit if you are not properly covered up. Campuhan Ridge Walk – The Campuhan Ridge Walk loop is one of the best outdoor activities in Ubud itself. It’s a relatively easy walk, which ends up at a lovely green rice field. We recommend doing the Campuhan ridge walk around sunrise or sunset as otherwise the midday heat will make it a struggle. 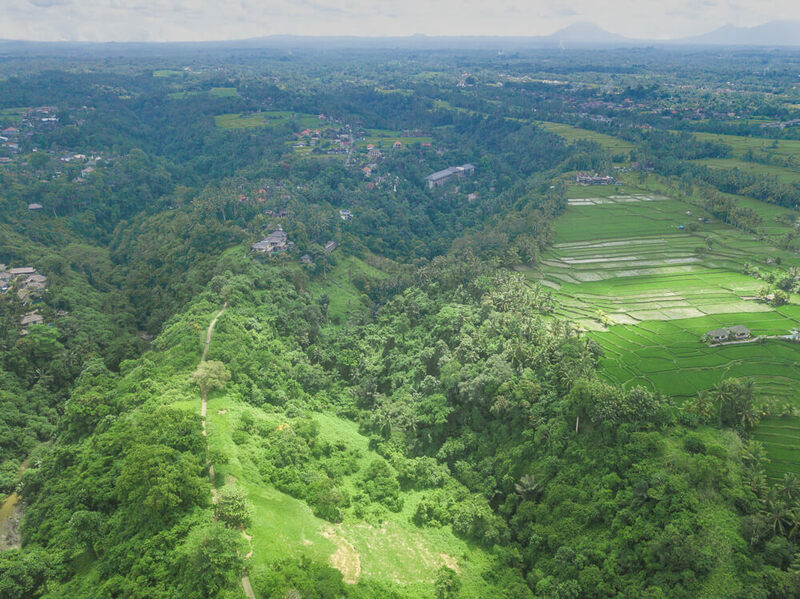 There’s no entrance fee for the Campuhan ridge walk so it’s worth the effort if you have the time, but we wouldn’t make it a priority if your time in Ubud is limited. Ubud Palace – A short visit to Ubud Palace is worth including on your itinerary. Although there is not too much to see, the royal residence is home to some lovely Balinese architecture. Entrance is free and due to its central location you’ll probably pass it plenty of times – so just pop in when you have 15 minutes to spare! It’s also possible to see a cultural dance performance at Ubud Palace for 100,000 Rupiah. Day trips – There are plenty of day trip experiences if you want a bit of adventure during your time in Ubud. A particularly popular option is to hike the active volcano Mount Batur for sunrise – something which is offered by many local operators. The view is incredible and well worth the early start! It’s also possible to climb the active Mount Agung – although recently this isn’t the case due to increased activity levels of the volcano. The hike at Agung is said to be quite tough and only recommended for more experienced hikers – so you’re probably best off sticking to Mount Batur if you’re not the most experienced. Should you prefer a bit of adventure without so much effort as a hike then you can go rafting on the Ayung river or quad biking in Ubud! 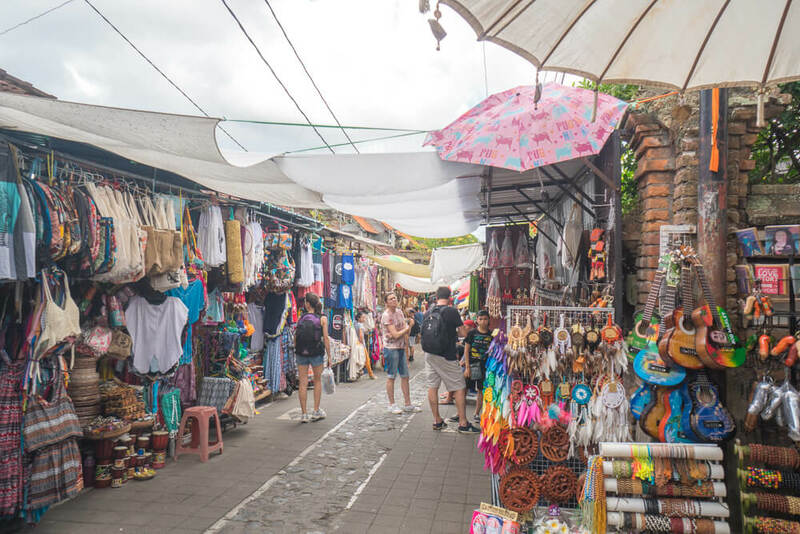 Ubud Market – If you’re looking to do some shopping in Bali, head to the central Ubud market. There’s a mixture of everything from cheap singlets to paintings and woodcarvings. Prices at the Ubud market are negotiable so if you hold your ground you may grab yourself a bargain or two! Yoga – Ubud is a hotspot for those looking to practice yoga, with plenty of classes to choose from on a daily basis. If this is something you’re interested in, we recommend reading this detailed guide to yoga in Ubud. Monkey Forest – One of the most popular things to do in Ubud is visit the sacred monkey forest. The forest spans over 12.5 hectares and is home to around 700 playful monkeys. There are three temples within the Ubud monkey forest and as such it is a sacred place, although there is no strict dress code. You can easily spend a few hours exploring the forest and enjoying watching the monkeys get up to mischief. 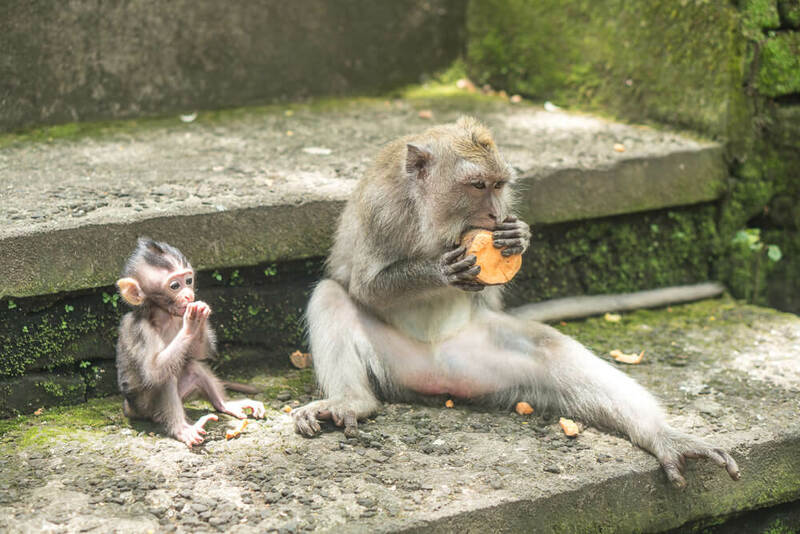 One thing to be wary of when visiting the Ubud monkey forest is that the monkeys do sometimes bite tourists, which can raise concerns about diseases like rabies. There are guards on hand to protect against aggressive monkeys, but to be safe we recommend avoiding taking any food with you or trying to feed the monkeys. You should also avoid eye contact with the monkeys as they take this as a sign of aggression and may attack in this scenario. The price for entry at the Ubud monkey forest is 50,000 Rupiah for adults and 40,000 Rupiah for children. Rama House is perfectly located on the same street as Ubud market, and just a short walk from Mingle – a great place for happy hour drinks! It’s also a short distance from Jalan monkey forest/monkey forest road, which is a main road in Ubud. For around $18 USD (256,000 Rupiah) per night, you’re able to get a double room with air con and breakfast included – great value considering the location! Click here to see the latest prices for Rama House for your trip. If you don’t mind a 15-minute walk to the centre, Dipa Home Stay is a great budget option! Rooms have air con and prices start at $12 USD (171,000 Rupiah) per night, which includes breakfast! Click here to see the latest prices on Agoda for Dipa Home Stay. If you want to spend your days enjoying a beautiful swimming pool in a tranquil location, Udaya Resorts and Spa is a wonderful option. Although the property is a short 10-minute drive away from Ubud centre, shuttles run multiple times a day to take you into the town. Prices start from around $130 USD (1,847,000 Rupiah) per night, although these may be higher or lower as Agoda regularly offer discounts. Click here to see the great offers Agoda have available at Udaya Resorts and Spa for your trip! If one pool isn’t enough, you’ll be glad to know Plataran Ubud Hotel and Spa has 2 pools for you to cool off in! On top of this, they offer stylish, comfortable rooms with air con as well as two restaurants and a spa on site. Although it’s around a 20-minute walk to the centre of Ubud, it’s brilliantly located near to the Yoga Barn, which is perfect if you’re hoping to take a class or two. During the high season rooms start from around $144 USD (2,046,000 Rupiah) per night but it’s common for prices to be discounted on Agoda. Click here to see discounts available at Plataran Ubud Hotel and Spa during your trip. Komeneka at Bisma is a secluded property with brilliant jungle views, even though it’s just a 10-minute walk from the main street of Ubud. The hotel has everything you could hope for – from 2 swimming pools to a poolside bar to a relaxing spa. During Bali’s high season prices start at around $308 USD (4,375,000 Rupiah) per night but as this is the busiest time of year prices do tend to fluctuate. Fortunately, Agoda regularly offer good discounts – so if you’re looking for a bargain click here to find the best price at Komenka at Bisma for your trip. This stunning resort in a small village 15 minutes north of Ubud is a peaceful and luxurious escape. There’s a beautiful infinity pool to enjoy and if you splash out you can even have your own private pool – perfect for an early morning dip! The only downside with a property as beautiful as this is that you have to leave eventually! Room rates start from around $268 USD (3,807,000 Rupiah) per night on Agoda, although prices do vary a lot during high season. Thankfully Agoda have great discounts available – so click here to see what deals are available at Natya Resort for your trip! Warung Krisna – Warung Krisna is the perfect spot for delicious local food on a budget. The meals are packed full of flavour and the lovely owner serves the best Mie Goreng we had in all of Indonesia – so for us it’s a must eat in Ubud. Most meals are available for less than 30,000 Rupiah, which makes it great value for some of the best Indonesian food in Ubud! It’s also a lovely setting with some Balinese art to enjoy. One of our best tips for travelling Bali is to eat at the local warungs, and Warung Krisna was our favourite one on the whole island! Ayam Yummy – Ayam Yummy serve the best chicken we’ve had on our travels anywhere in the world! For just 65,000 Rupiah you can get a chicken breast served with your choice of side, salad and sauce. Not only is it great value, but also it’s some of tastiest chicken you’ll ever have! In our opinion the title of best restaurant in Ubud is a toss up between Ayam Yummy and Warung Krisna. Mingle – With a selection of both Indonesian and Western cuisine at reasonable prices, Mingle is another good option for eating out in Ubud. One of the best things to do in Ubud at night is take advantage of the 2 for 1 cocktails during their happy hour. You can even start early if you want, with the happy hour running from 4pm-9pm! Uno – Normally we wouldn’t recommend trying pizza in Indonesia as we’ve had too many bad experiences, but Uno was the exception. Their pizzas are cooked in a wood fire oven and they don’t disappoint. It’s more expensive than the other choices on this list, but if you’re craving a good pizza it’s worth the money! Mama’s Warung – Mama’s Warung is another option for traditional Indonesian food at a great price. Although the warung is further than other options from the centre of Ubud, if your homestay is nearby it’s still a great place to grab a tasty meal on a budget. You can also do a cooking class with Mama herself! Warung Sen San – In terms of portion size, Warung sen san was the best value for money that we found in Ubud. They serve up big portions of classic Indoensian dishes while still keeping prices low. The owners are extremely friendly and serve all dishes with a smile! Wondering where to go next in Bali? Spend a few days on the beautiful island of Nusa Penida where you can swim with manta rays, visit stunning beaches and more! Click here to see our guide to Nusa Penida! 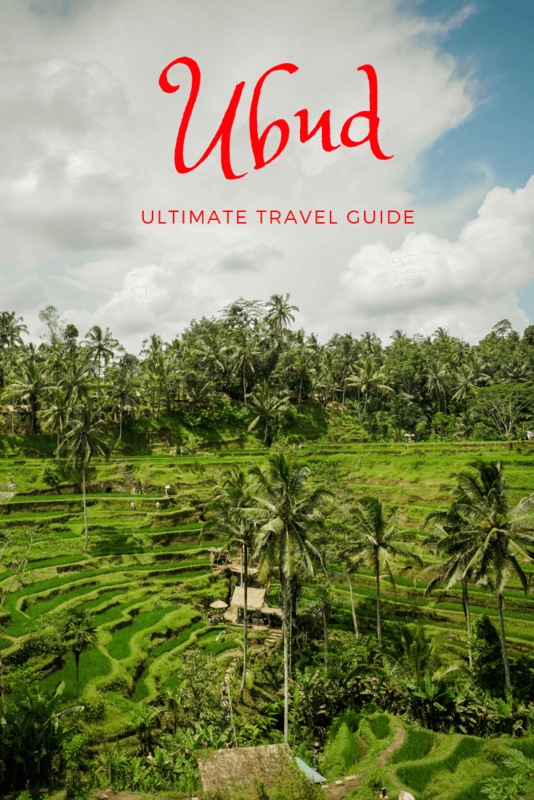 Like this Ubud travel guide? Pin it! Wish I had come across this post before my trip to Bali! 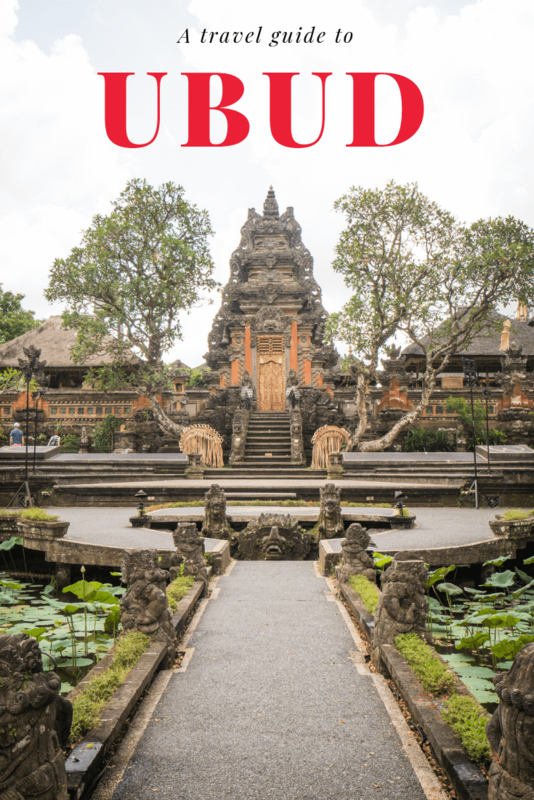 Such a fab guide to Ubud and all the best bits are here! Thanks – we’re glad you liked it! Hope you had a great time in Bali and we’re looking forward to seeing your content from there!